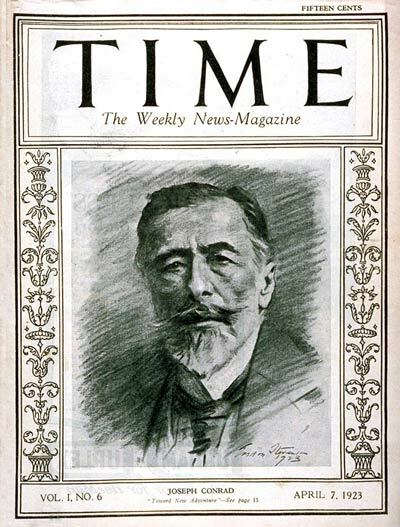 My blog of April 17, Review: Today, concerned a novel by David Miller on the death of Joseph Conrad. Since I had never read any of Conrad’s work, I bought Selected Short Stories and The Rover, by Conrad. As well as The Rover. the book includes eleven of Conrad’s twenty-six short stories, selected and commented on by Dr Keith Carabine of the University of Kent. In his introduction to the stories, Dr Carabine says that Conrad’s great distinction “lies in his ingenious and rigorous exploration of the undiscovered possibilities latent in one of the genre’s most familiar forms, namely the framed short story in which a first-person narrator (who is sometimes a member of the group) introduces, comments on and encloses another’s tale.” As Dr Carabine says, the theme of most of the stories is man’s fate, and they are often “teasing and enigmatic”. The framed construction of these stories introduces uncertainty in that the main narrator and the teller of the tale may have different interpretations of the events, leaving the reader to draw his own conclusions. Two other general points I would make about Conrad’s writing. First, he does not take great pains to capture the interest and attention of the reader at the beginning of a story. The beginning may be a page of detailed description of the opening scene, with little information about the character who is present, and a considerable, almost poetic word picture of the setting. In fact, Conrad’s word pictures of scenes are remarkable in their shaping of the mood of the story: mysterious, uncertain, uncommon, unusual. Moreover, Conrad is lavish in the extent of his descriptions throughout a piece. Some of this may be attributable to his writing for commercial publication in up-market magazines, where his compensation would be based, at least partially, on the word count. Each of these stories has at least one principal character who is confronted with some sort of existential challenge and has defects in his character which contribute to his downfall. Nonetheless, the reader is drawn into his predicament, hoping all the while, that the right solution will be found. The principal character in The Rover, which is set in the immediate aftermath of the French Revolution, is an ageing, sea-faring, privateer who has come ashore in the south of France to take his ease. There is also a dim-witted and committed old revolutionary, a young woman who has been psychologically damaged be the horrors of the revolution, a royalist French naval officer, and an aspiring young British naval officer, each of whom seeks his/her own solutions in the world. Who will succeed? The ingredients in the story include a plan to deceive the British fleet, as well as a search for love, and a re-ordering of the world between revolutionary-royalist lines, and a rough but beautiful Mediterranean sea coast backed up against a traditional rural society. One comes to have sympathy for the dilemmas of each of the flawed but real characters, and one can sense the tensions between them, as well as having a sensation of being on the rough bucolic scene, or on board one of the ships. The Rover is an engrossing tale. The one aspect which I found annoying was the slow pace of the conclusion. One cold feel it coming, but Conrad was in no hurry to jump into it. There was much detailed scene setting and character back-story telling. We were familiar with the scenes, and the character enhancements should – I think – have come earlier. Nonetheless, The Rover is a satisfying and interesting tale.